Have you ever come home to find an unwanted critter has walked through the cat flap? The classic design is simply a flap in a door that allows your cat to come and go as they please. But this simplicity also allows other animals easy entry to your home. The best means of denying unwanted house guests is by installing a Microchip Cat Flap. These clever designs only began gaining commercial traction in the last decade, but they have been a game changer for pet owners. This guide has been written to inform you and help you choose the best microchip cat flap for you. 1 What Is Microchip Cat Flap & How Does It Work? 4 Which Microchip Cat Flap Is Best? What Is Microchip Cat Flap & How Does It Work? As the name suggests, a microchip cat flap has a reader which utilises passive RFID (Radio Frequency Identification) technology to scan your pet’s microchip. This microchip is also known as a PIT tag (Passive Integrated Transponder). The chip transmits a signal containing the identification number when radio waves from a scanner activate it. 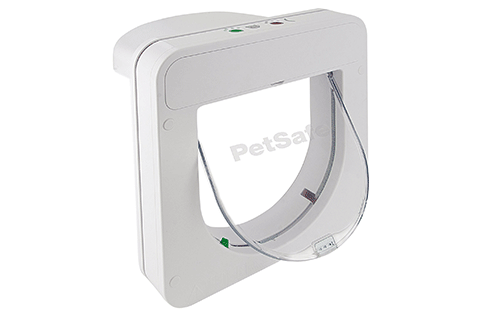 The RFID reader will pick up the signal from your pet’s microchip and attempt to match it to the identification you have programmed into the scanner. If it is a match, then the door will unlock. There are several different companies which produce these types of cat doors. It can be difficult to understand what it is you need for your pet, and what you need to know before purchasing. This section has been written to help you understand the important points you should know before making a decision. Not all cat doors are compatible with all microchips. For example, microchips from the UK and EU differ from those used in the US. And not all cat doors are built with the functionality required to scan both types. Alternatively, there are typically RFID collar tags available for use if there is a microchip incompatibility. These are no bigger than any other tag that goes on your cat’s collar. An important consideration to remember is battery life. It may not seem like a big issue, many of the doors are low usage and the batteries used are able to last for some time. But if there is a large difference between products, say one that will last a year vs. one that will last a year and a half, that half a year means you need to purchase new batteries more often. This would make it a more expensive purchase in the long run. Similarly, not all cat doors come with a timer control function. Some are much simpler than others, and this is usually reflected in their price tag. For safety and security, it may be prudent to consider whether or not you require a cat door with a timer control. Some doors are certainly easier to fit and install than others. And not all are suited for all areas. For instance, one may be well suited for glass doors and another might not. Perhaps one is able to be fitted into a brick wall and another is not. Consider where you are planning to install your cat flap and whether or not the product is suitable for this. Not all cats are the same size. And you may even be searching for a door that a small dog can fit through. It is prudent to measure your pet accurately so you can be sure that there is no risk of them getting stuck or being uncomfortable when using the pet door. Depending on the conditions of where you live, certain doors may be better suited than others. If you are in a colder climate, for example, please be sure to check the weatherproof rating of the door you are considering. Also, be sure to choose one that will last the long battering the elements tend to bring. Simply by being in sunlight all day, every day, a cat door may eventually wear down. Look for durability and weatherproof longevity. Be sure to compare warranty length and terms and conditions from each manufacturer. It may be possible that one is longer than the other and this would be a positive buying condition. Alternatively, one may cover damage that might be more likely in your situation than another that might not cover it. This is important should you ever need to file a claim. This product is a #1 bestseller for a good reason. It is compatible with worldwide microchip formats, make it a globally available solution. If your pet is not microchipped, it comes with a RFID collar tag. The Curfew Mode is an interesting one that allows you to restrict your pet’s entry/exit to certain times of the day. Its rounded square design and clean, white, plastic material, as well as the transparent flap is pleasing to the eye. Allowing your pet easy access without having to sacrifice the aesthetic of your outside door. Even when not in use, your pet may use it as a window to the outside world for their viewing pleasure. 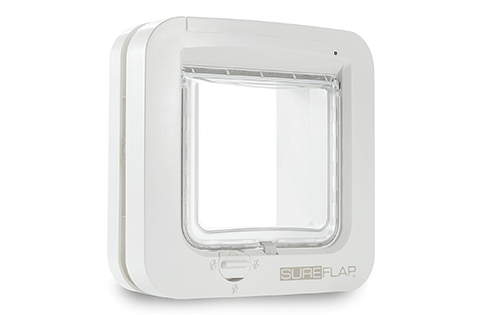 SureFlap Microchip Pet Door is the larger model of the cat flap and is suitable for some smaller dogs too and is often considered one of the best microchip cat flap in the UK. This version is slightly cheaper than the Microchip Pet Door. The reason for this is large because it is designed specifically for cats, and so is slightly smaller. The low noise, the transparent flap is guaranteed to keep foreign intruders out of your house, giving you peace of mind. Unlike some models, this version comes with an extra mounting adaptor which makes it suitable for glass doors as well as the standard walls, windows and wooden doors. 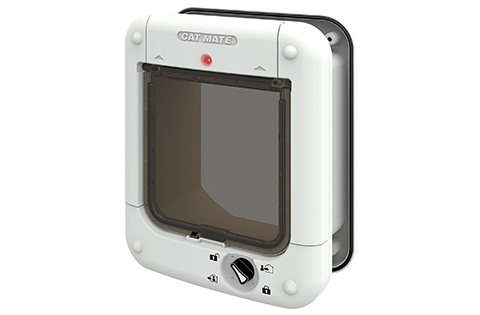 The “dual scan” technology also allows you to keep some pets inside and allow others outside, as per your choice. This is important if you have certain cats who might make trouble or are too young to be outside alone. It is also programmable for up to 32 cats. 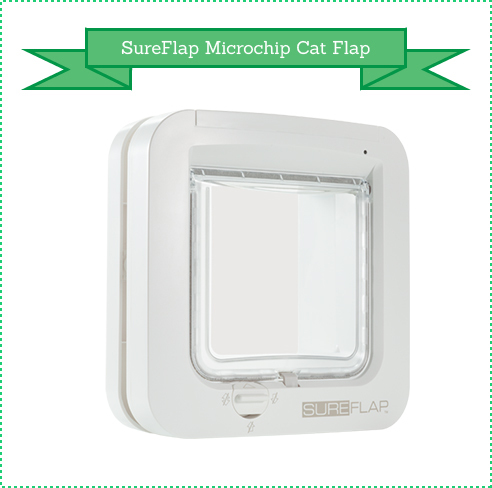 The Sureflap Microchip Cat Flap is compatible with 9, 10 or 15 digit microchips, Check with your local authorities as to which type is used in your area. This model is slightly cheaper than the Dual Scan because it does not require the added technology. This Cat Flap is no issue if you are not selective about which pets can enter or exit at which times of the day. One thing to be aware of is that this is a smaller model than the Pet Door, so be sure your pet can fit through it before purchasing. The Cat Mate Microchip Cat Flap is one such product. The door comes with a 4-way rotary lock, for choosing what method of locking you want to allow or disallow. Whether you want to fully unlock it, only allow entry, only allow exit or entirely close the door. This model has an excellent, smooth design to it that may provide access to certain larger cat breeds. 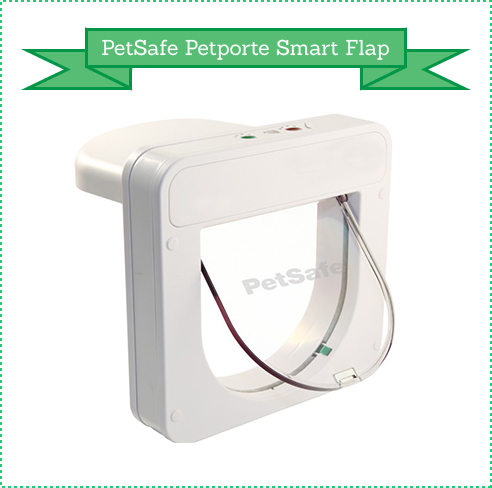 The Petporte Smart Flap has been designed for durability and ease of use. The simplistic wall mount and door-mount design makes it compatible with standard doors, as well as wooden, PVC, metal, glass, but not walls. Keep in mind that this model has been designed to function primarily with UK and EU standard 15-digit microchips. Because of this, it is one of the more common types of microchip cat flap in the UK. It also comes with an optional night mode allowing you to restrict the times your pet can enter or exit. 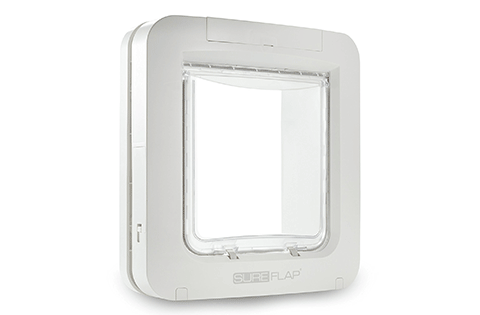 Which Microchip Cat Flap Is Best? There are not many microchip cat flap reviews available, so, this is a difficult question to answer your questions. It depends on your budget, the size you require or whether you need a dual scan. 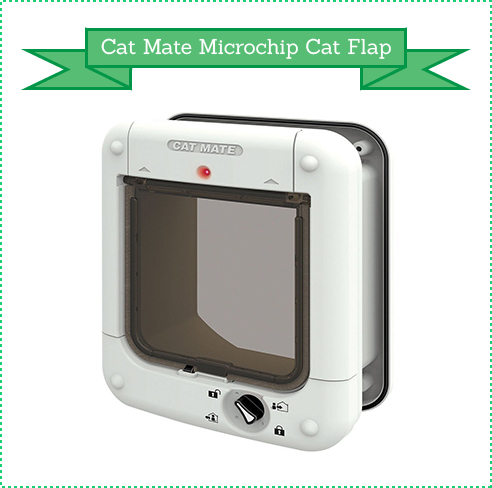 For those on a budget and with a regular sized cat, then the Cat Mate Microchip Cat Flap may be your best bet. With its lower price tag and smooth design, it’s a great option. 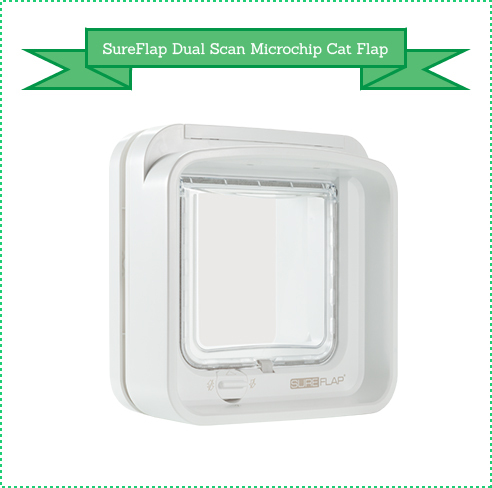 If you need dual scan for selectively allowing one pet entry/exit and disallowing another, then you will need the Sureflap Dual Scan. And finally, if you have a small dog as well as a cat. Or if you have a larger cat. 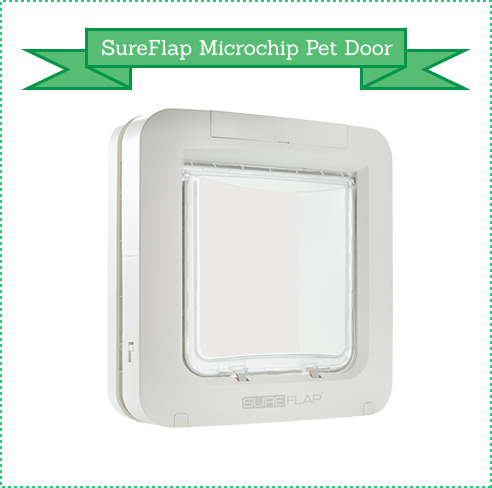 Then you will need the Sureflap Microchip Pet Door. There are several options available to cat owners who have the need for a cat flap. 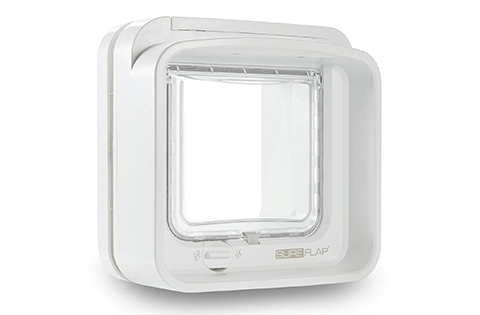 While it is a newer field, the older models still hold up perfectly well, and for this reason, Sureflap remains the big dog of the industry. But the choice you make will depend on what your specific circumstances require. Hopefully, this guide will help you choose which is the best microchip cat flap for your family.